Arun Kumar Viswanathan is a VP, Project & Implementation at Attune and has 14 years of experience in sales and customer management. Arun has been associated with brands like Medall, NIIT, Merrill and RR Donneley in key positions in the past and was responsible for operations and strategic planning to drive growth. Prior to Attune, Arun was accountable for green and brownfield expansions for Medall Healthcare, and was responsible for managing operations and scaling the business for a large state in India. With Merrill, Arun spearheaded the launch of a new vertical that led to setting up of an offshore model in India. 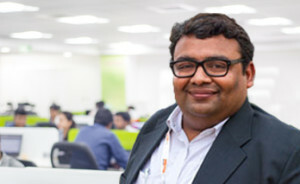 At Attune, Arun is responsible for large enterprise implementation and client specific needs across India and Malaysia. Arun is MDP certified from IIM Ahmedabad and a computer science graduate from University of Madras. Arun has keen interest in music and sports.